Far Cry 2 is a first-person shooter video game developed by Ubisoft Montreal and published by Ubisoft. It was released on October 21, 2008 in North America and on October 23, 2008 in Europe and Australia. Crytek, developers of the original game, were not involved in the development of Far Cry 2. It was announced on January 3, 2008, that in addition to Microsoft Windows, Far Cry 2 would also be available on the PlayStation 3 and Xbox 360. For all of these apples-to-apples tests we have both testing scenarios being tested at the exact same settings. We are using the highest in-game settings of “Ultra High” selected in the “Overall” option. All we have done is switch between DX9 and DX10 API with the in-game selection. 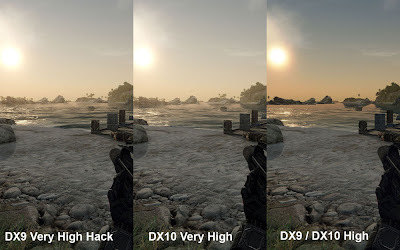 The resolution is set to 1920x1200, AA is disabled in one set of tests and enabled at 8X AA in the other set, and AF is at the highest level the game supports.